Antique Victorian pressed glass miniature jug on stem and circular foot with raised relief design of flowers and ivy-type leaves. A delightful miniature cream jug OR for using to add a little water to a whisky dram. Antique Victorian Davidson White Pressed Glass Thistle & Shamrock Milk Jug. Thistle and Shamrock Pattern. Antique, Victorian Davidson white pressed glass footed Milk Jug. This mark dates the jug to between 1880 and 1891. Davidson mark (Lion sitting on a wall) clearly marked on the underside of the base. This is quite a stunning dish. and has the pretty pattern I’m calling pineapple design. It’s In brilliant condition with only the slightest scratches barely visible. In Davidson's Thistle,Rose & Shamrock pattern. Condition is good but it does have a tiny hairline on the base as pictured. Pretty pattern and fluted edge. Large Victorian Pedestal Dish. Weight: 1.180 kg. VINTAGE VICTORIAN 1890 PRESSED GLASS WHEELBARROW OPEN SALT DIP AMBER GREENER? IN THE FORM OF A WHEELBARROW IN AMBER COLOURED GLASS. 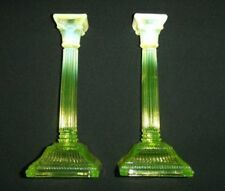 Antique Style Pressed Glass Candlestick with Lustres. The candle holder and drip tray are removable for easy cleaning. A pretty glass and silver plate compote or footed bowl dating to around the turn of the 20th century. The silver plated pedestal features an alternating leaf and bead design of late Victorian design. This large Victorian moulded dimple jelly or sundae glass has a single row of dimples around the belly. The condition is excellent. (CONDITION:Good Condition, Slight Age Wear, Perfect. 2-3 weeks to many locations). OTHER INFO. George Davidson Purple Malachite Marble Patterned C1900 Glass Footed Bowl Ht 5"
The pictures should show all. This beautiful little table salt is in excellent used condition with no chips or nibbles etc. It is 7cm high by 9cm across. I will post immediately upon payment, thanks for looking. An attractive large purple malachite pressed glass pedestal Bowl, unmarked but. Circa: 19th century. Good overall condition with a small area of old restoration which is now starting to yellow. Very beautiful & unusual Peace & Plenty footed bowl, dating to the later 19th century. I have seen various Peace & Plenty glass pieces, but not this one. I believe it’s a a Henry Greener bowl from the 1880s from their Wear Flint Glassworks in Sunderland. Antique Pressed Glass Double Dish with Handle. Leaves. Sowerby? Pretty leaf design, wavy edge. Probably never been used. Length 8 1/4", width 7 1/4", height 3 1/2". Small round dish. Reg design number 413701, number for Davidson Glass. Oval dish with one handle. Reg design no. 354027. Stunning, Victorian, deep blue, pressed glass, footed bowl. Wavy edge. 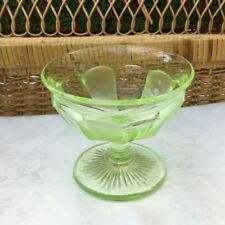 Greener & Co - 2 Handled Fan Shaped Pressed Glass Dish - 9" wide - 1887. Victorian Clear Pressed Glass Double Bonbon Dish. Rd. 75016. Sowerby? Estimated era of 1890-1900 Victorian Uranium Glass & Metal Sugar Bowl And Cream Jug Collectible A very rare Victorian Sugar bowl and cream jug with silver colour metal rim and spout. In very good condition and not often found. The glass reacts to uv light but the glass is a very dark shade. Would enhance any collection greatly. Bowl 3 inch diameter and 3 inches deep. Jug 2 inch diameter and 3 inches deep. Overseas buyers please ask for postage quote. GLASS MILK JUG. VICTORIAN ITEM. TRADITIONAL STYLE. HIGHLY ORNATE/DECORATIVE/FANCY PIECE. PHOTOS DON`T DO THE PATTERN JUSTICE. It is stamped with " Rd 325194". 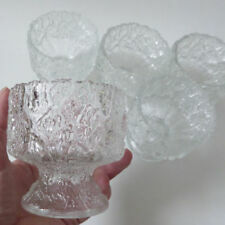 A Victorian Clear Pressed Glass Bowl / Vase -. The have a lovely diamond shape pattern and the sugar bowl is a trophy shape. Very unusual pair. There is the tiniest mark near to the rim, too small to photograph. Not a chip, just a mark. Moulded in the form of a wicker basket with handles on either side. It stands 2.75" (7cm) high at the handles edge. Here is a fantastic glass compote that I believe will date to the late 19th Century. The compote is in overall good condition. This is a very heavy / dense item with a good thickness in all areas of the item. An antique small Victorian black pressed glass cream jug with cherub design, the design possibly of Silenus. There is a large flattened / polished area of the design, below the handle, this appears to be period to the item but could possibly be later. Beautiful pressed glass celery vase with etched fern pattern and pressed pattern. There is roughness / scratches to the rim of the jug, mostly to the spout area with a small 1mm chip / knock to the rim also. Any major faults will be listed. This model is not marked as John Derbyshire and does not have the Rd or Anchor mark. However the pattern is strongly aligned with the better Derbyshire models and is generally attributed to this factory. Antique Victorian Glass Milk Jug Sugar Bowl. 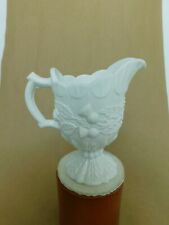 Decorative Collectible Jug stands 14 cms high Bowl is 9 cms high. We have moved house so item can now be collected from Billington. We have moved house so item can now be collected from Billington. A beautiful Pressed Glass bowl with Oak Leaf and Acorn pattern Victorian ? This really is a stunning pressed glass bowl. I'm not sure if you call the edge fluted but it is really effective and the pattern of oak leaves and acorns is really unusual. I'm not sure but I think this is a Victorian, late 19th Century piece of glass. Victorian Glass Jug. Clear Glass. Vintage. Lovely shaping to this piece. Simple classic shape with shaping to handle.